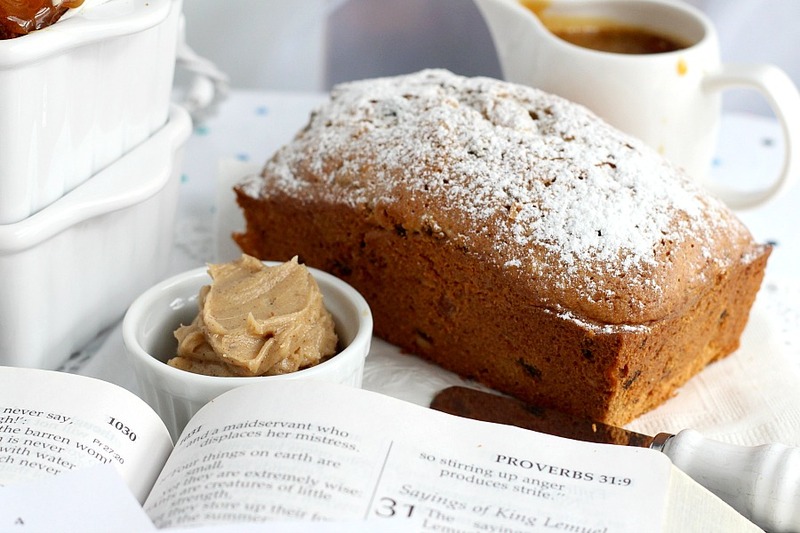 Full of dried fruit and topped with a burnt sugar syrup, Scripture Bread is delicious sliced and toasted for breakfast or snacking. 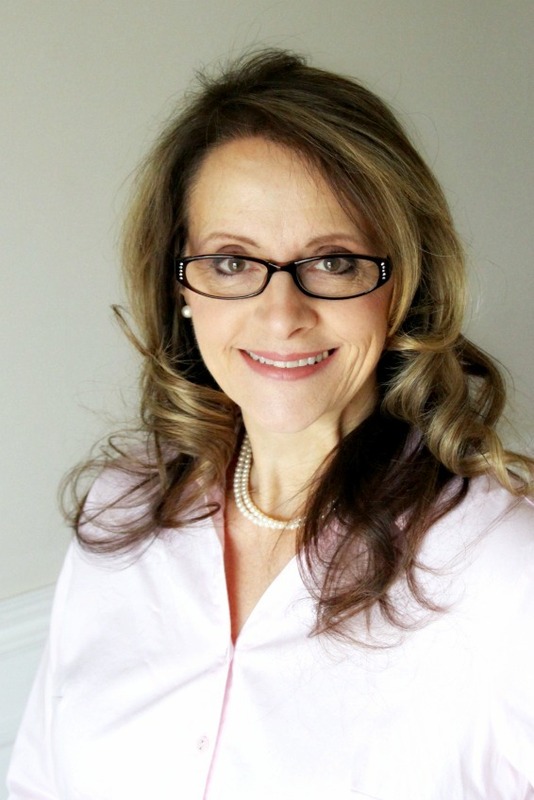 Try deciphering the recipe ingredients using clues from Bible verses. 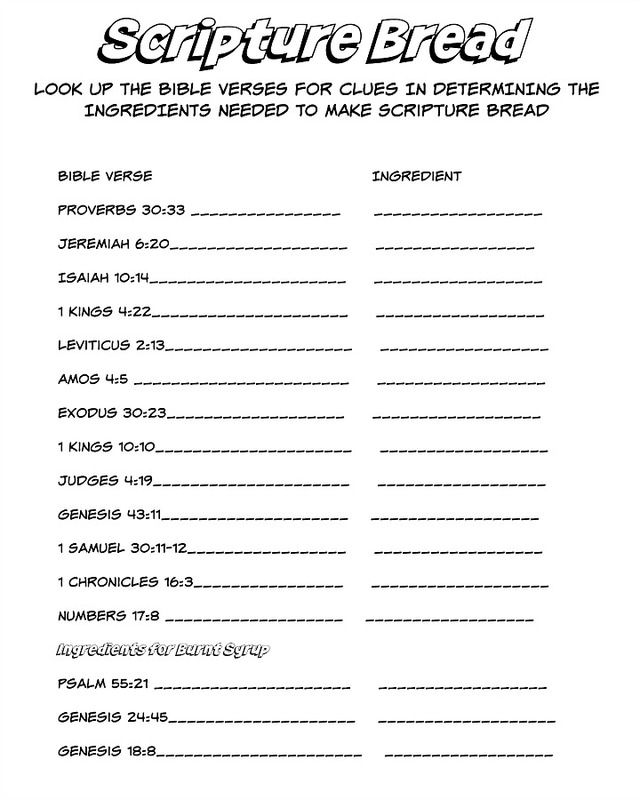 This FREE printable is a great way to encourage kids to search Scripture. 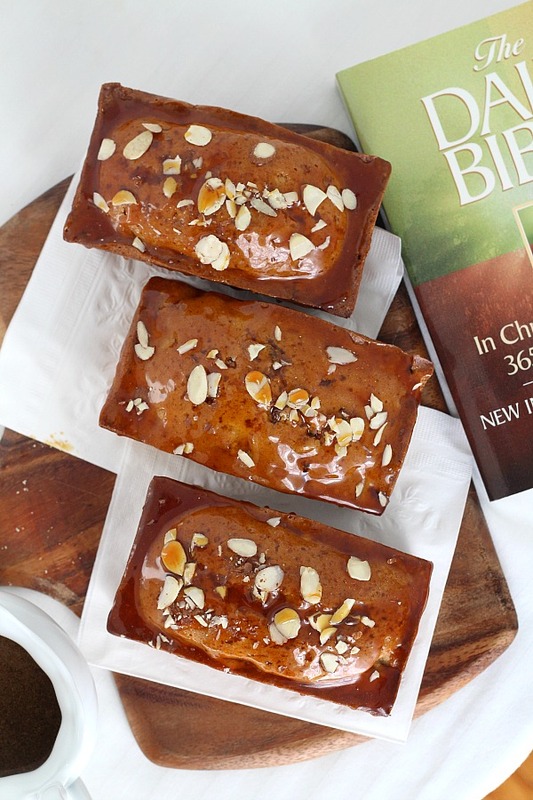 Scripture cake bakes into a nice cake but I like to make it in small loaf pans. They are the perfect size for gifting and I also like to freeze them for the convenience of having to simply thaw as needed. If I slice a mini loaf before freezing, it is easy to pop a piece or two into the toaster for a quick snack. The burnt sugar syrup is pretty amazing but it is a little messy in the toaster. 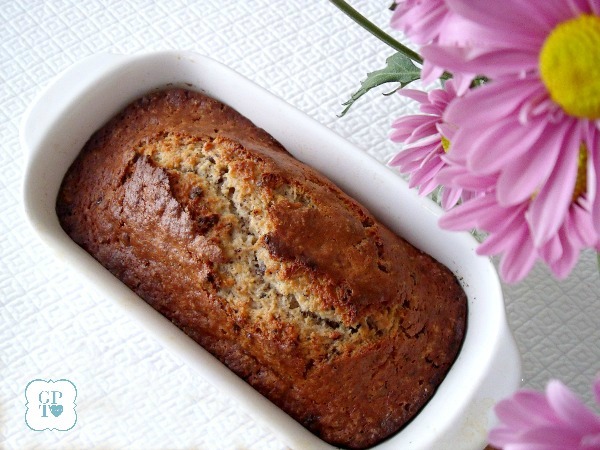 If you prefer, leave a loaf or two plain and then spread a slice with sweet cinnamon butter. How is your Bible knowledge? I’m pretty sure you don’t have these verses all committed to memory. 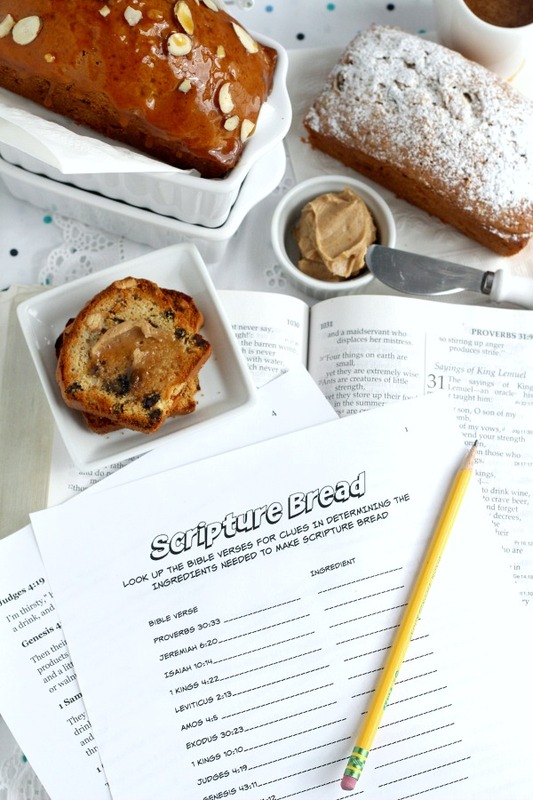 Turn baking into a biblical brainteaser and use scriptural references to guess the bread ingredients. Download (below) and print the page then look the verses up in a Bible or on a Bible app. You won’t be able to come up with the exact ingredient list but you will be able to get most of them. See how well you do. Better yet, gather the kids and work on it together then have a baking session and make the bread. Grease 6 mini-loaf pans with non-stick spray. In a mixing bowl or the bowl of an electric mixer, cream butter and sugar until light and fluffy. Beat in egg yolks, one at a time, mixing well after each addition. In a bowl, sift together flour, salt, baking powder, cinnamon and spices. Mix flour mixture into butter and egg mixture, alternating with milk, just until flour is just blended in. In a third bowl, beat egg whites until stiff; fold into batter. I use a rotary egg beater in a 4-cup glass measuring cup instead of washing the mixer beaters and bowl. Fold in chopped nuts, figs, raisins, apricots and dates. Bake until a cake tester inserted into center comes out clean, about 45-55 minutes. Remove from oven and place on a wire rack to cool. After a few minutes, turn breads out onto wire rack to cool completely. Drizzle with Burnt Sugar Syrup. NOTE: If you are baking together with kids I suggest you make the syrup yourself. It is a little tricky and it gets very hot. The taste is amazing and worth the bother. Or, skip the syrup and sprinkle confectioners sugar on top and spread with sweet cinnamon butter. In a heavy bottom, 2-quart saucepan over low heat, melt sugar, stirring occasionally to prevent sticking. After sugar melts, continue cooking, stirring continuously, until it is a deep golden brown. Add water and cook, stirring frequently, until smooth. Remove from the heat, add butter and stir till until it melts; allow to cool. 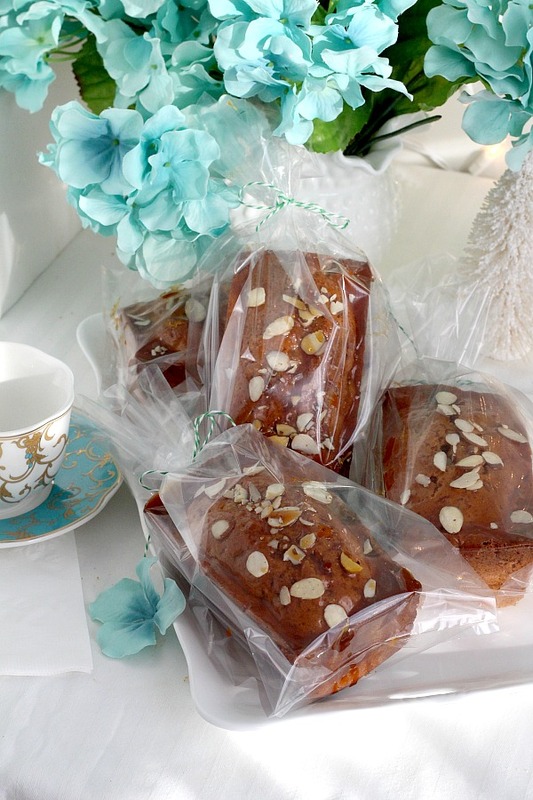 Drizzle burnt Jeremiah syrup over cooled scripture cake and garnish with whole almonds. With an electric mixer on smooch on a plate with a fork (my method) the soft butter, brown sugar and cinnamon until combined, creamy and smooth. Keep butter covered and refrigerated between uses. 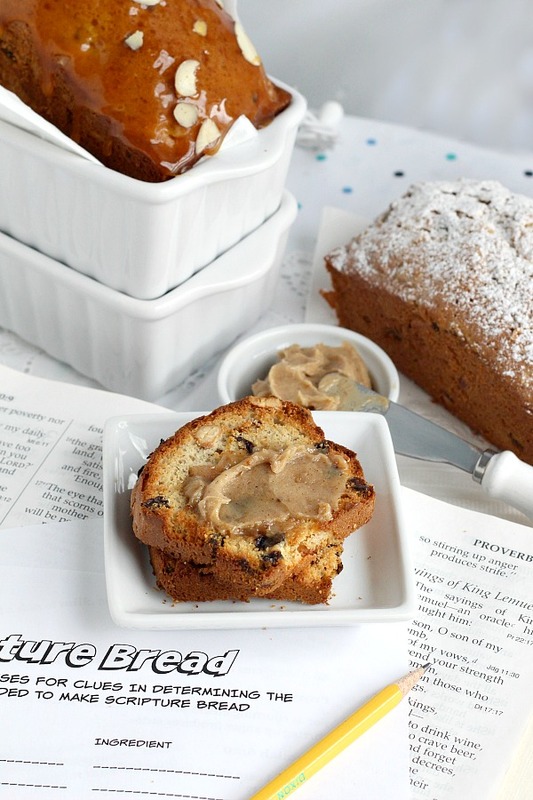 I’ve not heard of Scripture Bread before and it looks delicious, I love dried fruit in both bread and tea cake. What a fun idea for the ingredients.